When I was just a wee little gamer taking my first steps in the World of Warcraft it wasn’t on an account of my own. One of my ex-boyfriends introduced me to the game and encouraged me to make a character on his account to try out the game in the hope that we could play together. He gave me the booklet to see what races and classes there were and I set out to reading what I wanted to become. After a long time looking through the book and then fiddling around in the character creation screen I settled for a Female Human Mage, I wanted to be able to fling spells, but not in an evil way and I liked the way Humans looked in their robes. 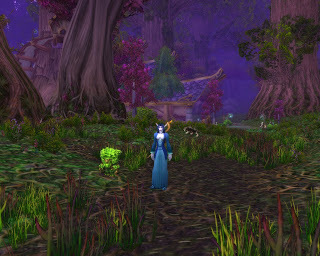 That mage never made it past level 20 because we broke up, but I still have fond memories of running around and exploring the world of Elwynn Forest and Westfall, and also dying a lot. This was when TBC had only just launched and there was no lowered XP to get to max level, mounts were only available from level 40 and higher and clothies were slaughtered easily by any mob you would encounter if you had no idea what you were doing. I can’t remember much of the mage, I didn’t really get the chance to play her much, only that I chose Frost as specc because “omg I can summon a Water Elemental then” and the only profession I had was Tailoring because it would let me craft my own gear, which came in handy because I had absolutely no money nor help in the game. Because I do really fondly remember that Mage, and I obviously can’t get her or those circumstances back, I decided to start a little project. I made a new Mage on a new server with no money, I changed the race from Female Human to Female Nightelf (I’m a huge Nightelf lover, they’re my favourite race in the game) but her main/levelling specc will be Frost, I’ll pick up Tailoring as first profession (not sure yet about which one I want as second) and in addition to this I’ll be levelling up a new pet team aswell. And so I present to you: Sanelle with her trustworthy Blossoming Ancient companion. No I don’t really name my pets, maybe I’ll get round to it someday but for now I wouldn’t know how to name them in the first place. As I said, I’m on a new server with no gold or levelling items to help myself. I have accepted a spot in a social guild to give me that 10% experience boost and because my first Mage was in a guild aswell. I’ll be reliant on my own professions and wits to make “a living” for myself on this server. Luckily for me Blizzard has implemented some things to help me gather bags etcetera faster and I will be picking them up when I can, I don’t want to be stubborn and not take the handles Blizzard have given me to ease my gaming experience. I’ve struggled through TBC when it was still hard and prefer not to relive that experience again. How much time I’ll be spending on this project I don’t know yet but I’ll keep you updated on how it goes, might even get a character feed going if I can get my hands on a decent RSS, but you will see how my pet battle team fares as it will be displayed on the right side of my blog.